Robinson High School’s College and Career Center, nicknamed “The Cube,” was established in October, 2012 to support school goals involving post-secondary academic and career planning for students. The Cube is supported and funded by the Robinson High School Foundation. 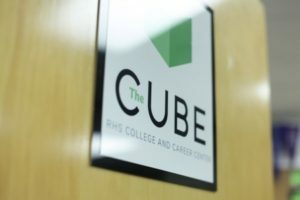 Mission: The Cube is a resource center that provides students with information they need to develop a concrete plan for college, technical school, military, or employment upon graduation. Goals: To meet with seniors, juniors and sophomores to raise awareness about the range of post-secondary options available to them, help them explore their goals, and guide them through the steps necessary to achieve their goals. Methods: Parent volunteers staff The Cube and support Robinson’s College and Career Counselor (CCC) in providing resources and information to students of all grades. Information is conveyed to students through individual meetings, small group discussions, classroom information sessions, and electronic means. Monday – Friday 8:45am – 3:30pm.